c. If not paid by the 22nd of the next month (or at least 45 days past the billing date), a delinquent letter is sent which states that the bill must be paid in full within 10 days of the date of the letter. d. If not paid by this date the water is turned off. e. The entire bill, including the $50.00 reconnect fee must be paid in full or the water will not be reconnected. 2. When the water is shut off to a property and payment is made after 4:00 PM of the same day, the water will remain off until the next business day. 3. No partial payments of water and trash bills will be allowed. The amount that is shown as due will be paid by the due date listed. a. A letter must be sent to the East Petersburg Borough Council, which will be addressed in a public meeting, stating what the hardship is. The customer MUST be present at the council meeting to state their case. b. If approved, the total bill due will be divided by three and an appropriate due date will be set for the payment to be made. In any event, the bill must be paid current by the time the next bill is due. c. In the event the payment is not made by the agreed to date the water will be shut off and will not be turned back on again unless the bill is paid in full, including the turn off fee. ENROLL NOW TO PAY YOUR WATER/TRASH BILL ONLINE!! No more waiting for the mail. Make your life easy by receiving and paying your bill online. Our e-bill is a secure way to view and pay your bill online. By enrolling in e-billing, you’ll conveniently receive an e-mail when your bill is ready for viewing online. 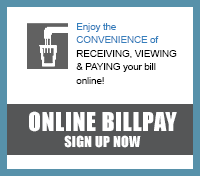 Say goodbye to paper bills and hello to the convenience of receiving, viewing and paying your bill online!